This page allows you to import users from a comma separated format file. This allows you to automatically import the list of users, and groups from any source that can export to csv format, and automatically synchronize the lists. Just re-import to synchronize the list, or use the scheduling to have it done automatically. Use this setting to enable automatic scheduled synchronization of the users from a CSV file. You can specify how often to attempt to import the csv file. If the file is not present the import will be retried after 1 minute. If the file is still being written when the import is attempted, the import will be retried once the file has stopped changing size. 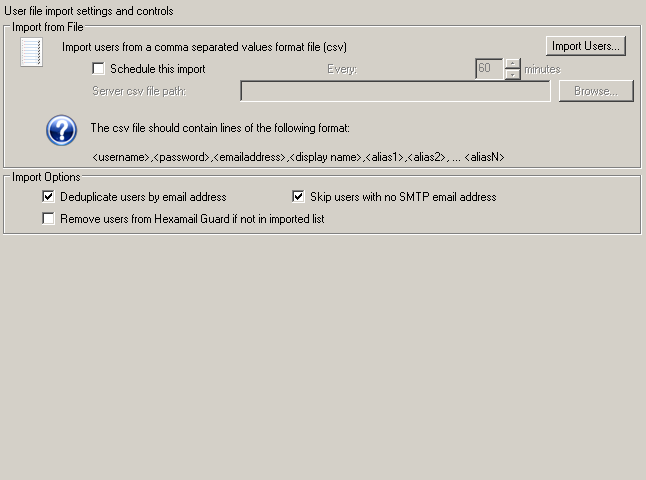 In order to schedule import from a CSV file you must specify the SERVER path to the file. The file must be accessible to the server software, and the path specified should be an absolute path to the csv file.